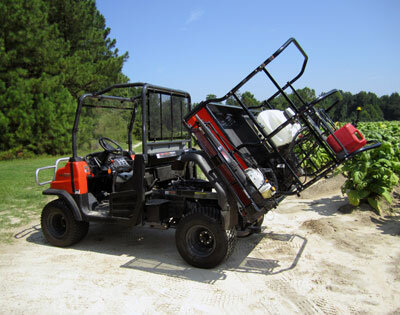 Introducing the Kubota RTV RAC System, the ultimate heavy duty carrying solution. You’ll be amazed at the loads carried with an RTV RAC and the effect that has on your crew’s efficiency. The cargo box is the most underutilized component in an UTV. The cargo has the most potential to transform your RTV into a workhorse specially suited for your tasks. 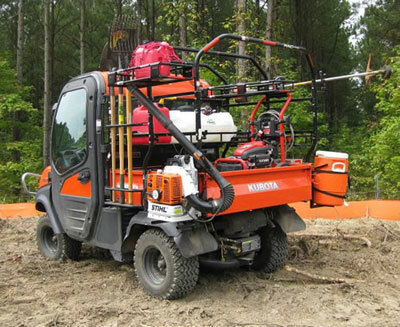 Transform your RTV into a workhorse with the Kubota RTV RAC System. 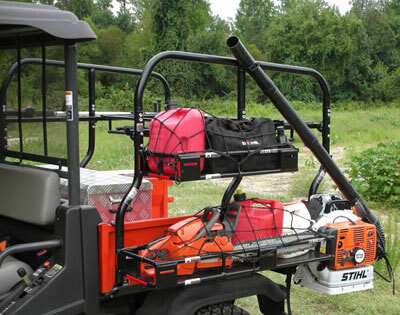 Perfect for professional ground crews, nurseries, municipalities or any vehicles needing to carry different types of tools & equipment in specific configurations. The vehicle becomes a mobile tool shed and workbench. Facilities will see significant improvements in team productivity with more time in the field, less trips to and from shop, and the vehicle itself being transformed to an efficient work station. Gear is separated from cargo and best of all the dump bed still dumps without any interference no matter how you load the RAC system. The system is totally modular and can be configure and reconfigured to near endless possibilities. Expand your RAC system as your needs grow. The RAC system can easily be expanded from a half RAC structure to a Full RAC structure. Interchangeable Components. You can reconfigure your RAC structure on the go. Items are secured quicker and easily accessed for a smoother workflow. Make the most out of the underutilized cargo box. The cargo box provides the majority of the function in an RTV but often there is a lot of unused space even when the bed is full. The RAC system expands the function of an RTV by taking advantage of this unused space. Carry larger loads and keep your equipment from getting damaged by separating your load from your equipment. Easily remove your load without having to rearrange tools. tools and equipment, including hoses, ropes, backpack blowers, chainsaws, string trimmers, water coolers, shovels and more! Secure awkward items with ease. Such as ladders, string trimmers, shovels, etc. The baskets are designed to fit and secure all kinds of items. The RAC System has an enormous range of users because it can be configured so many ways and in large or small configurations. Farmers use it to carry tools on the outside of the RAC Structure while carrying hay, feed, or calves on the inside. Maintenance Crews use it as a mobile workstation. They can carry all their tools with them by incorporating their own attachments in conjunction with the RAC System attachments. The RAC system simplifies storing, organizing, and accessing tools and also clears up the bed space for quick repairs. 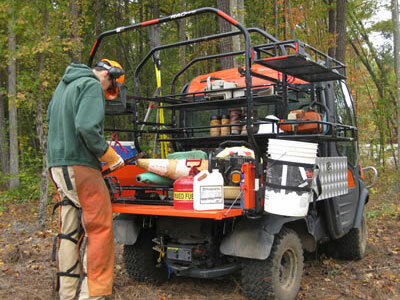 With the amount of equipment and supplies your crews can carry, the RTV RAC system makes an ideal mobile workstation. Institutions needing to haul goods from building to building can place a tarp over the RAC system to haul weather sensitive items. Nurseries can haul many flats and other plant pots by installing extender baskets. Tools can then be carried on the outside of the structure with the clip baskets. Homeowners can maintain their property easier by carrying their tools and heavy loads at once. Hunters use the RAC structure to maintain their food plots in the off season and keep their guns and equipment away from their kill during hunting season.